Don’t you love it when those first fronts of cooler air sweep over the land, harkening autumn’s arrival? It is time for fall fun – marshmallow roasts, corn mazes, harvest festivals – and camping. And when you come camping for fall fun in Virginia your options are limited only by time. Do you want to pitch your tent or park your RV near the coast, enjoying a mix of oceanside scenery and autumn colors that extend well into November, or do you want to head for the one and only Blue Ridge where regal mountains and deep valleys are clothed in a cornucopia of color, where mountaintop vistas extent to distant horizons. Camping for fall fun means not only do we park our RV or pitch our tent at scenic locations, we also enjoy nearby autumn activities. If you want to maximize your camping experience Virginia is the place! Check out the following Virginia camping destinations for fall fun. Then get out there and make some fall fun memories of your own. What You Need to Know: Recently voted best RV resort in the nation for the 3rd time! Situated on the south shore of the lower Rappahannock River where it opens into Chesapeake Bay, this resort is top notch when it comes to on-site fun and being kept in excellent shape. Over 700 campsites are ready for you and the place is smoothly run, no hassles. They have a host of services and activities, so many you never have to leave the place, everything from fishing charters to movies to corn hole tournaments, live music, kayaking and canoeing, even wellness programs. Recommended Fall Fun: Take a cruise on the restored tour boat Chesapeake Bay Deadrise and enjoy the fall colors, or bring your own boat for aquatic leaf viewing. 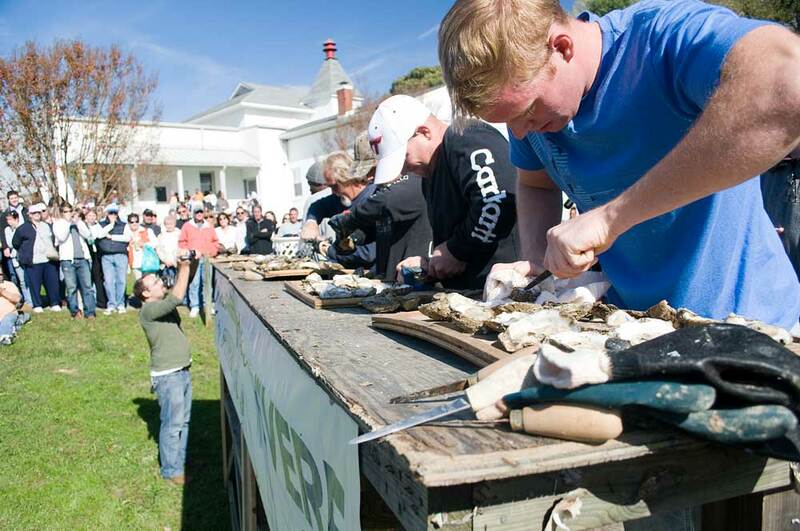 The local Urbanna Oyster Festival in early November is a tradition that has been celebrated for six decades. Eat oysters every way they can be prepared, learn about the oyster industry and life in Chesapeake Bay. Explore nearby Wake Beach or head across the Rappahannock River to Belle Isle State Park for an autumn hike. Nestled in the mountains in the valley of Back Run, this historic campground offers superlative natural beauty and outdoor activities combined with convenient access to nearby towns such as Lexington. With only 41 campsites the refuge offers an intimate experience where you can be one with the mountains. Flush toilets, warm showers are available. You can jump onto hiking trails directly from the campground. 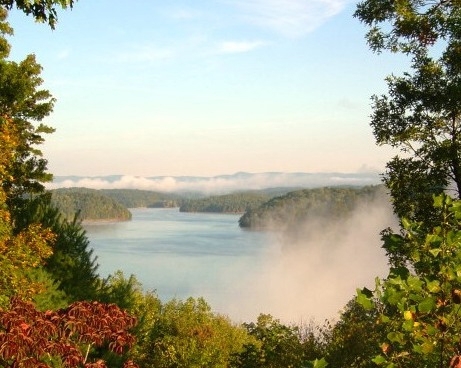 Recommended Fall Fun: Take a hike around Cave Mountain Lake, encircled by mountains. Head up to the nearby Blue Ridge Parkway for a fall color drive. You can also pick up the Appalachian Trail and take a stroll on Virginia’s master path through Thunder Ridge Wilderness. 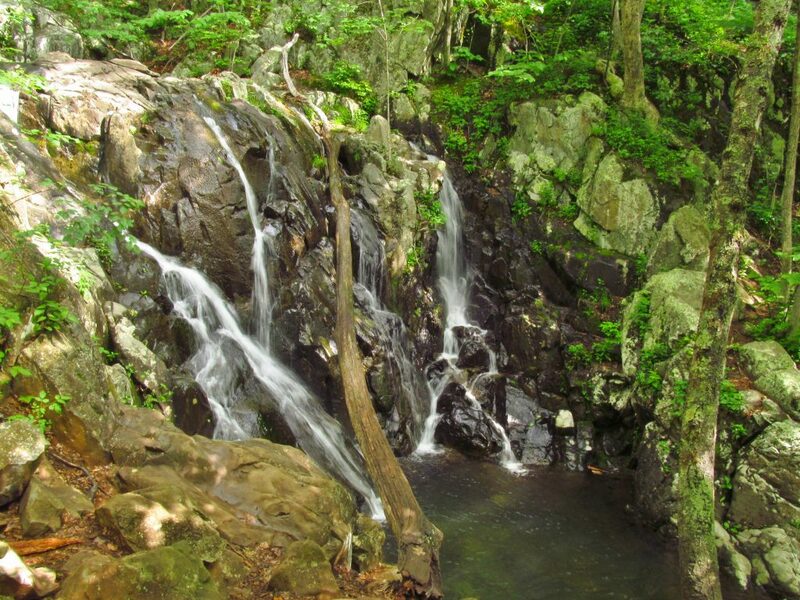 Also, visit gorgeous Apple Orchard Falls. Big Meadows is at the heart of Shenandoah National Park and makes for a perfect base camp to explore the preserve as well as nearby autumn activities. The highland camp is large, offering over 200 sites with plenty of amenities such as hot showers, flush toilets and water spigots. Big Meadows is a field amidst the mountains and is a botanically rich area as well as wildlife hotspot, so area hikes and trips along Skyline Drive may yield a sighting of deer, wild turkeys or even a black bear. Recommended Fall Fun: Make a fall color trip on Skyline Drive. Hike to Lewis Spring Falls, Rose River Falls or Dark Hollow Falls. Climb to the top of Stony Man. Hike the Bearfence Mountain Rock Scramble. Have dinner at the Big Meadows Lodge. Head down to nearby Syria, Virginia for the annual Graves Mountain Apple Harvest Festival during October weekends. Enjoy hayrides, a hay maze, see apple butter being made over an open fire, pick your own apples, listen to live music. Take a pony or horseback ride. Graves Mountain Apple Harvest Festival is a whole lot of fun. What You Need to Know: This underappreciated campground never fills, making it one place you can always count on a campsite. Cumberland Gap National Historic Park is one of Virginia’s hidden jewels. The park is centered on Cumberland Gap, a break in the Appalachian Mountains used by animals, American Indians, settlers, and armies to enter Kentucky from Virginia. Today, you can park your RV or pitch your tent in a fine campground and explore the park’s history via car or trail. Sprawling Wilderness Road Campground is situated on a sloping, heavily wooded ridgeline. However, each campsite is leveled. Three full-service bathhouses serve the campground, with water spigots adjacent to them. Loops B and C have electric hookups and are the domain of RVs. Other than that, the many sites offer every possible combination of sun and shade. Recommended Fall Fun: An iron furnace, remnants of two Civil War forts, and a pioneer settlement are auto accessible historic features. Natural features include Skylight Cave, Cudjo Cave, and far-reaching views from the Pinnacle and my personal favorite, White Rocks. A system of shorter and longer trails spurs directly from Wilderness Road Campground. Grab a detailed trail map at the campground entrance station. Shorter paths include the Greenleaf Nature Trail, the Colson Trail, and the Honey Tree Spur Trail; longer ones include the Lewis Hollow Trail, which leads to Skylight Cave and the Pinnacle, and the Gibson Gap Trail. You can make a 10-mile loop out of the campground linking the Gibson Gap, Ridge, and Lewis Hollow trails. What You Need to Know: Hiking, mountain biking, historical study and trout fishing are moments away from the campground. I strongly recommend a camping trip here. I have camped at Elizabeth Furnace more than a dozen times and give it a ringing endorsement. With 30 sites situated along Passage Creek, the campground also has hot showers and flush toilets available through October. Bring your own water if camping there in November. The campground is low elevation yet deep in the mountains. Many of the campsites are close to Passage Creek. 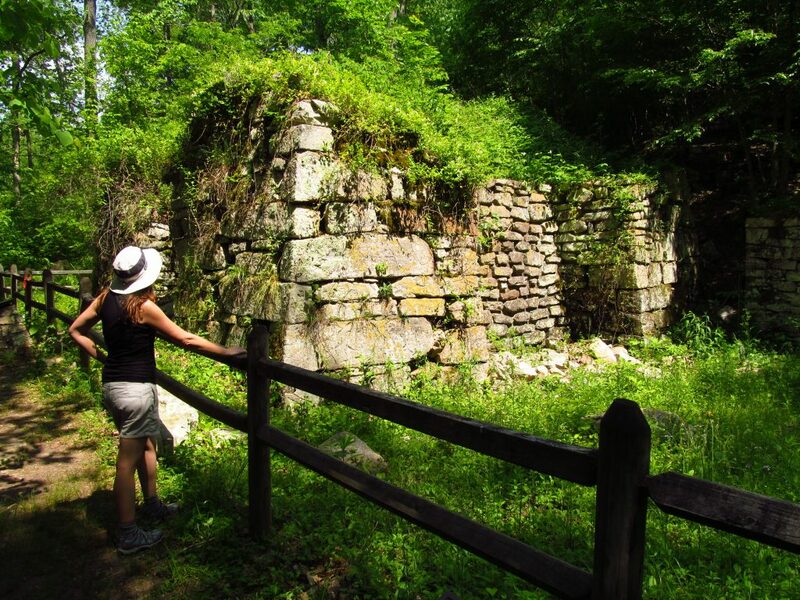 The charming and historic town of Strasburg is just a few miles away yet Elizabeth Furnace exudes a back of beyond atmosphere. 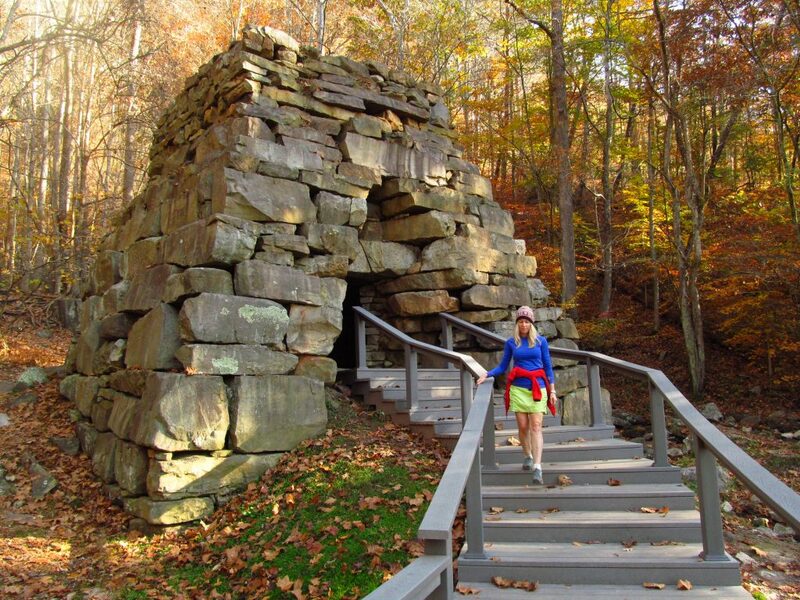 Recommended Fall Fun: Check out the nature trails around Elizabeth Furnace, a former iron forge. Grab a view from Signal Knob, an important post during the Civil War. Finally, make sure and visit the log cabin across the creek from the parking area. It is an easy drive to zip through colorful trees at Virginia Canopy Tours. Make a fall color float on the nearby Shenandoah River. Skyline Caverns would make a good visit on a rainy day. What You Need to Know: This campground is situated on 43 wooded acres of a working farm. Greenwood Farm Family Campground is a peaceful, serene getaway where you park your RV or pitch your tent in a wooded area of a working farm. The RV pull-throughs are long and level while the tent sites are nestled into nooks in the woods. They do offer non-wooded sites. Water and electric hookups as well as hot showers and flush toilets are available. Fish in a pond on site, no license needed. Recommended Fall Fun: I think it’s a cool idea to camp on a farm then visit the nearby Cox Farms Fall Festival, an ongoing autumn event. It is the biggest fall festival farm in Northern Virginia. Go on a haunted hayride or maze and sit by a big bonfire. Explore the fall produce market or the animal farm. Take the Imaginature Trail or participate in farm chores. Check out the antique farm equipment. There’s a lot going on a Cox Farms. What You Need to Know: This campground is well situated to explore multiple activities in the heart of Virginia. Twin Lake State Park sits on 548-acres and is carved out of the much larger Prince Edward-Gallion State Forest. Speaking of large, the campsites in the 33-site campground at Twin Lakes are all outsized and all have water and electricity. Located near Goodwin Lake, the camp is clean and in ship shape. Hot showers, and flush toilets are available and sites can be reserved. Recommended Fall Fun: Walk the trails around the two lakes, seeing the autumn colors reflect off the water. Ride a paddleboat or fish or kayak on the serene electric-motors-only lake. 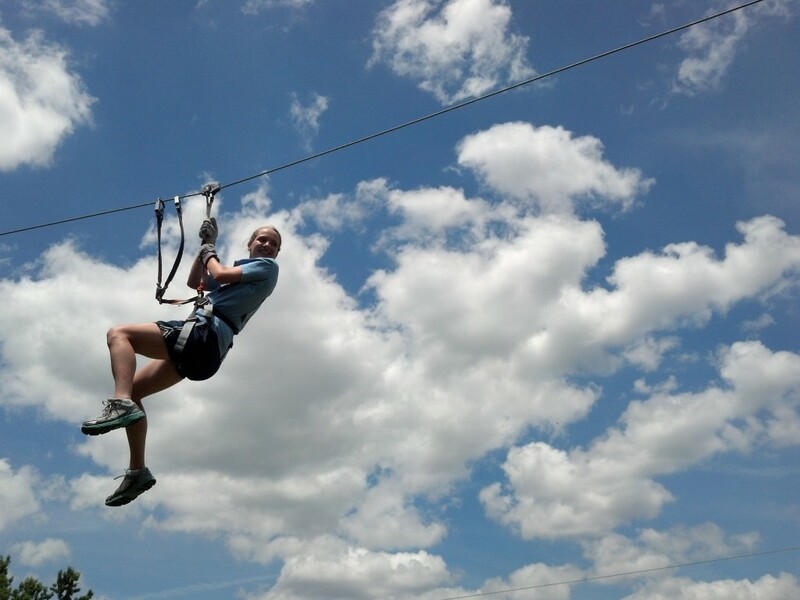 Another exciting place for fall fun is nearby Sandy River Outdoor Adventures, a zipline adventure park. Tackle over 20 zip lines in one location! 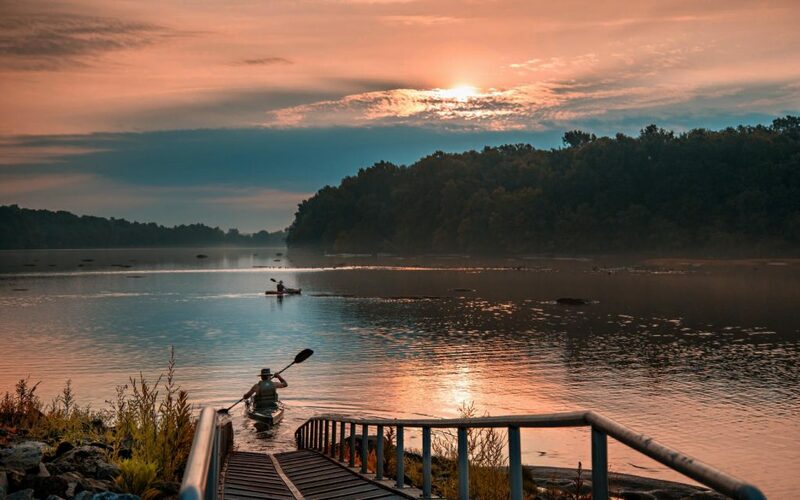 Other local adventures include paddling the Appomattox River or bicycling the converted rail trail that is High Bridge State Park. 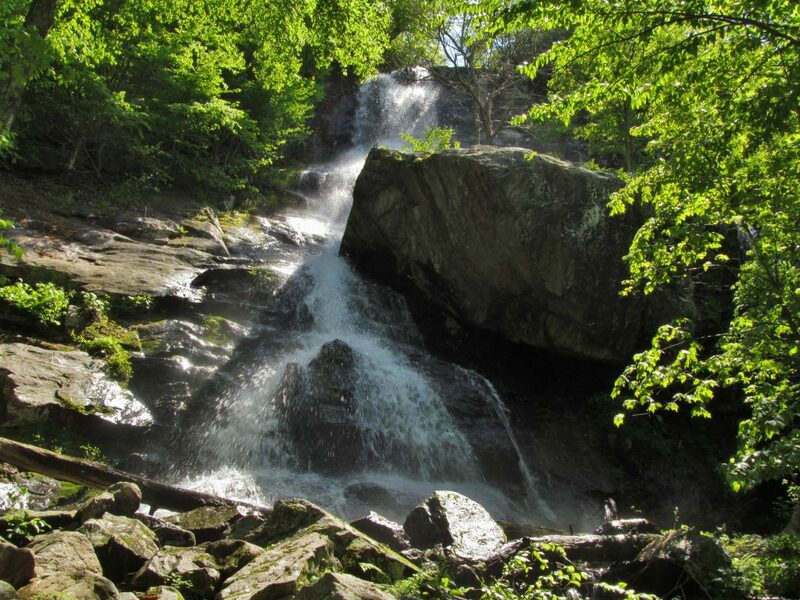 Grindstone is a well-kept, well-maintained campground at Mount Rogers National Recreation Area. A large flat at the upper end of the Laurel Creek is the setting for this shady old time camping area that is kept neat and clean, a place where time slows. Mount Rogers stands directly to the south and the Iron Mountains rise to the north. Nice campsites — many of them electric — hot showers and flush toilets make Grindstone attractive for those in an RV or a tent. Recommended Fall Fun: The Whispering Waters Nature Trail makes a .6-mile loop from near the campground amphitheater but the real action is in the surrounding high country, which is the loftiest in the state. The Mount Rogers Trail is the campground gateway into the Lewis Fork Wilderness, located just south of the campground. 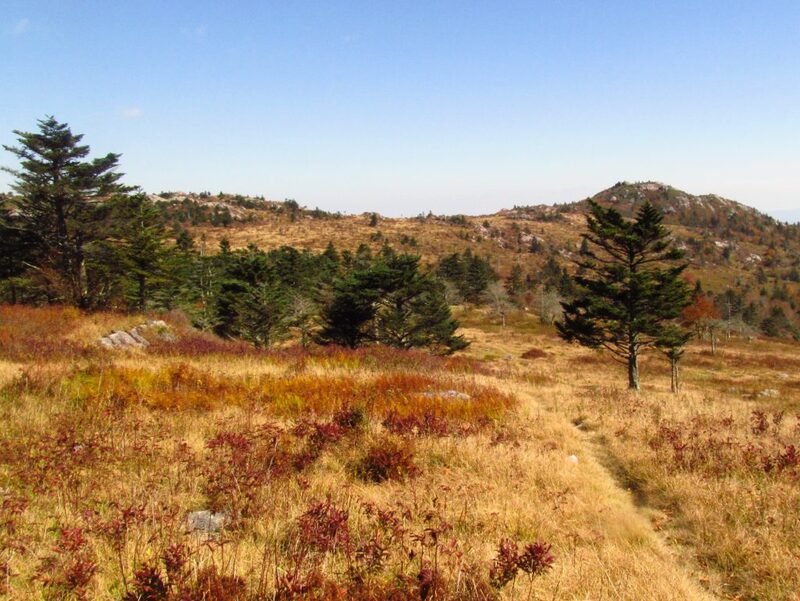 It’s a little over 2,000 feet to the top of Mount Rogers through the wilderness, but the change in flora will amaze. You can also drive to higher nearby trailheads, such as Scales, then more easily explore this land of open meadows, rock outcrops and dense tree stands complemented with wild ponies and wild bears. Also, the famed Virginia Creeper Trail is nearby, where you can take a 17 mile downhill bike ride through magnificent mountain and rural scenery. Enjoy land and water based recreation at this attractive and well maintained U.S. Army Corps of Engineers Campground. Philpott Lake stretches 2,900 acres and has over 100 miles of shoreline. Though it may be too cold to water ski, an autumn boat ride or fishing trip will enhance your campout. Enjoy panoramas of the Blue Ridge rising west from the campground. Most campsites have electric and water hookups. The bathhouses offer flush toilets, hot showers, and drinking water. A beach, boat ramp, dock and fishing pier are on-site. Recommended Fall Fun: Head to nearby Ferrum for the Blue Ridge Folk Life Festival, held at Ferrum College. Check out the folk music, sit in on a storytelling, enjoy the food and crafts. Or go visit nearby Fairy Stone State Park. Hiking trails, history and the strange minerals that give the park a name are there to be discovered. North Bend Park Campground is enveloped on three sides by huge Kerr Reservoir, a.k.a. Buggs Island Lake, the pride of Southside Virginia. The camp is run like a well-oiled machine by the U.S. Army Corps of Engineers. Just because this campground is on a lake and has a beach doesn’t mean it isn’t good for fall fun. North Bend Park Campground is sizeable with over 200 sites, but don’t worry about being full during autumn. Coveted lakeside sites with stunning views of autumn color should be available. Late October through mid-November is a great time to visit. Southside Virginia is still relatively warm then and the fall colors will surprise. Hot shower, flush toilets and electric sites serve all types of campers. Recommended Fall Fun: Have a ball bicycling the roads through the campground, especially in cooler autumn. A fishing dock makes angling easy and shorter interpretive trails can be picked up right from the camp. Take your boat, kayak, or canoe out on the lake to see autumn from a new perspective. Take a bicycle ride on the nearby Tobacco Heritage Trail, a rail trail great for a linear ride.